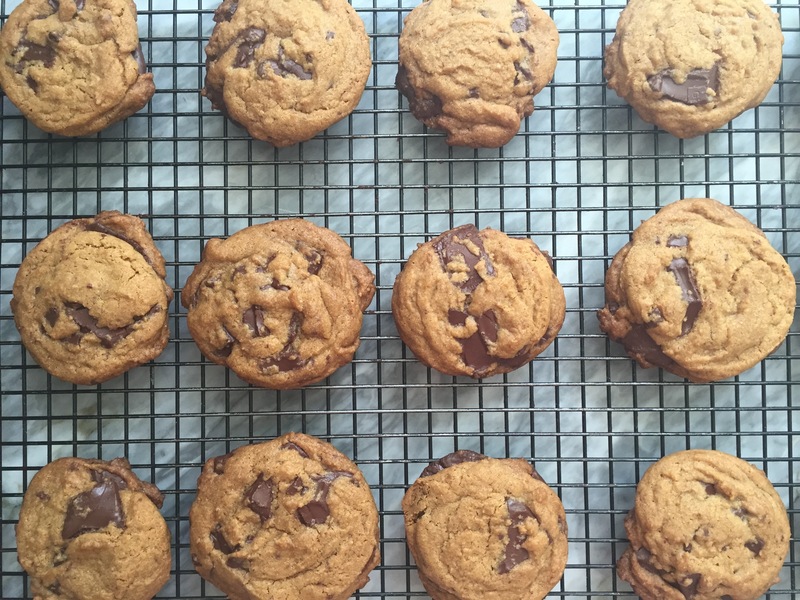 What more can you say about chocolate chip cookies? 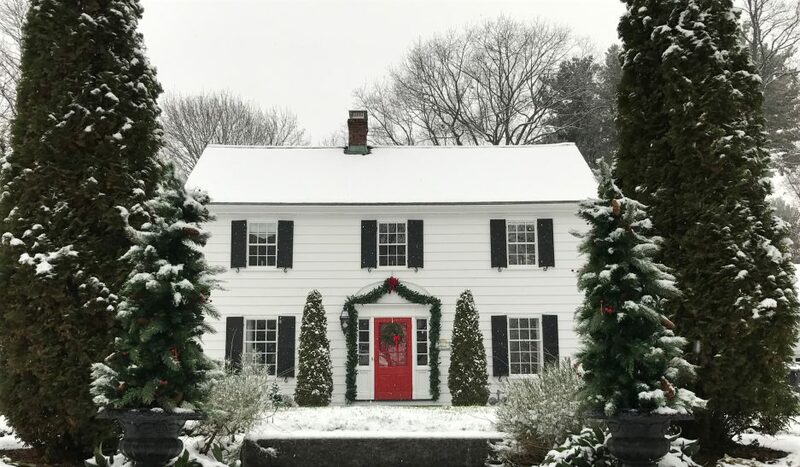 They have been around for over 75 years, invented by Ruth Wakefield who owned and operated the Toll House restaurant in Whitman, MA. If you’re interested in learning more, please see this New Yorker article for an interesting history of one of America’s most iconic sweets. 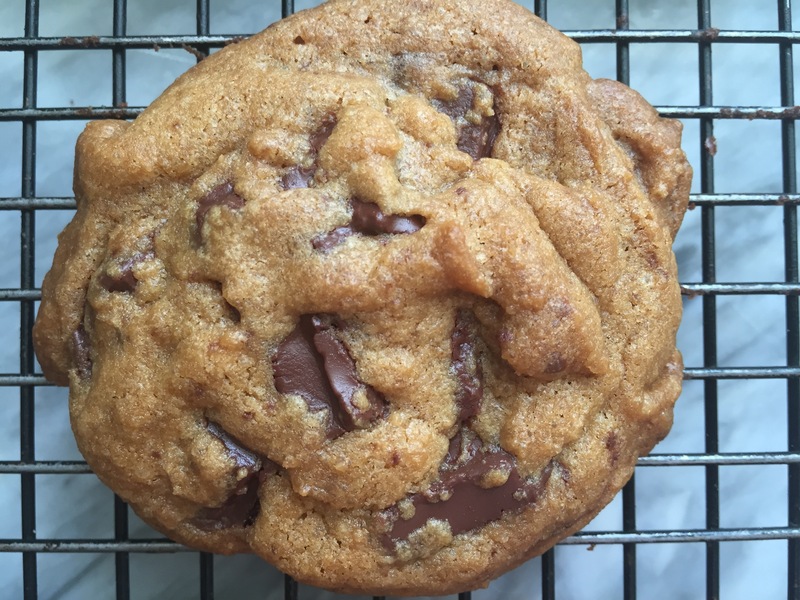 Today there are an infinite number of chocolate chip cookie recipes, but your hunt for the best is over. Chocolate Chunk Cookies stand apart from the competition because of the chunks, not just any chunks, but coarsely chopped or broken pieces of bittersweet chocolate. 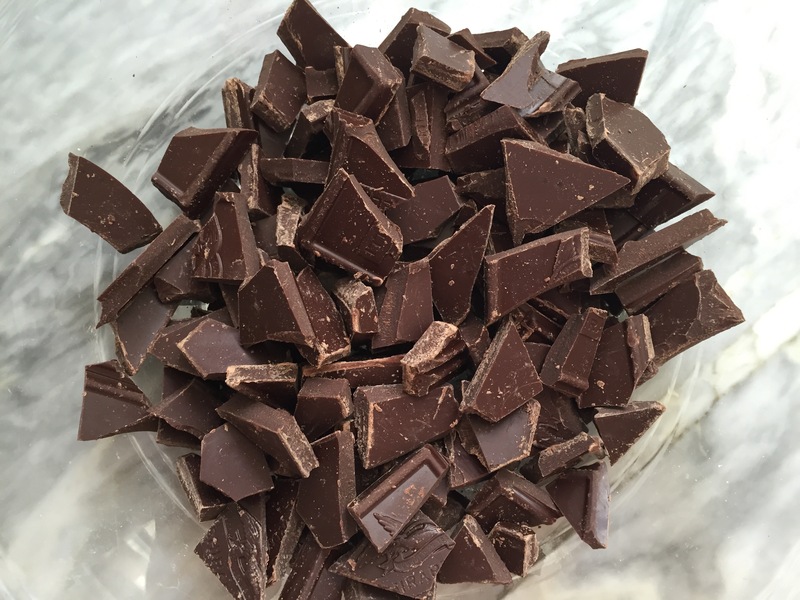 The size of the larger pieces combined with bittersweet chocolate make all the difference. A very smart friend mentioned another bonus- these cookies are better for you because of all the antioxidants in the dark chocolate. So pour a glass of red wine milk and enjoy. 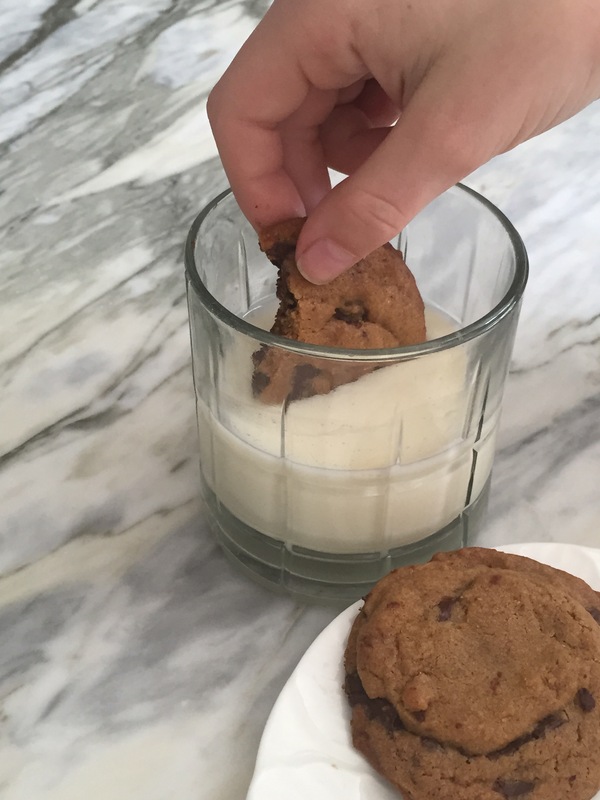 Making Chocolate Chunk Cookies is pretty straightforward. Cream butter and sugar, add an egg, some flour, baking soda, salt, vanilla, and most importantly the bittersweet chocolate. The best part is “coarsely chopping” the chocolate. And by coarsely chopping I mean whacking the wrapped bars against the countertop. Multiple times. Of course, if you want to chop, go right ahead. But smashing those chocolate bars does feel pretty good. After repeatedly whacking the chocolate, carefully unwrap to reveal your chunks. 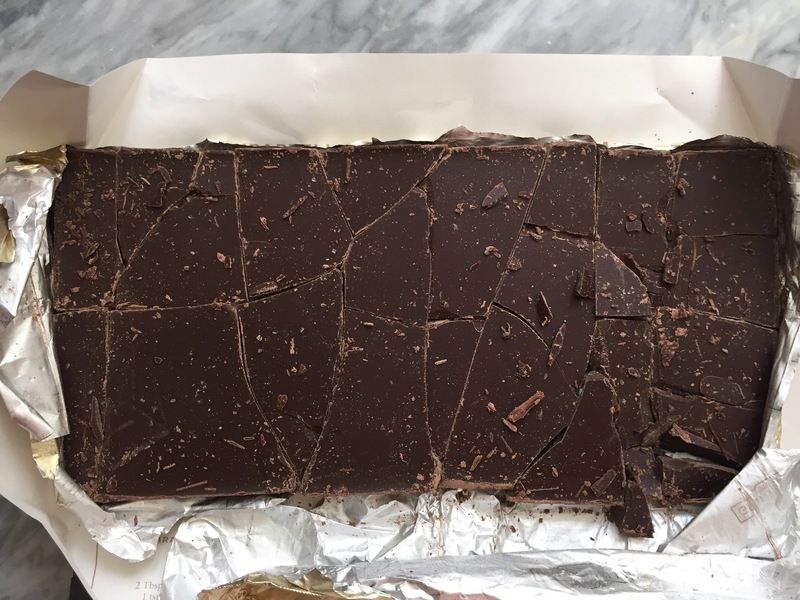 Use your fingers to break any larger sections of chocolate into more “bite sized” pieces. My favorite tool to use for scooping cookie dough, muffin or cupcake batters is an ice-cream scoop. Everything comes out perfectly uniform and I don’t have to spend time scraping spoons to get the dough or batter to drop. 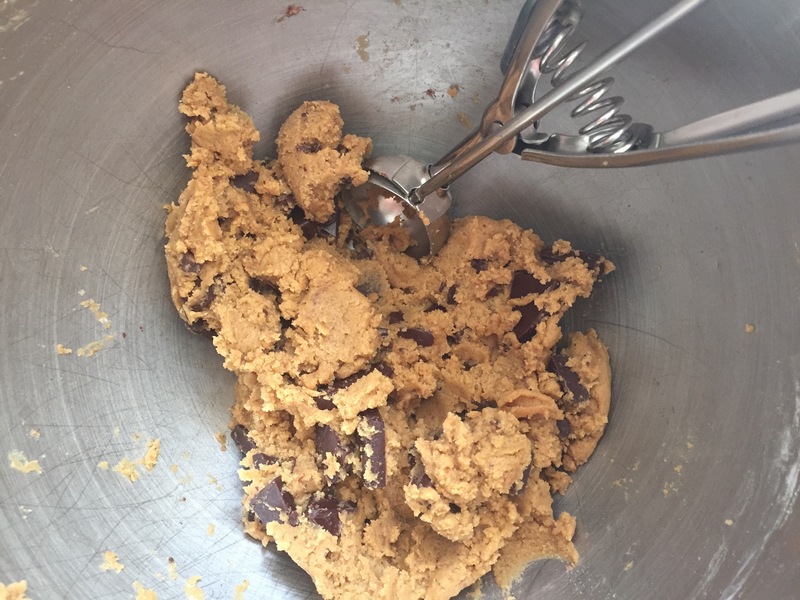 Use an ice-cream scoop to drop perfectly formed and portioned cookie dough rounds. The other tool I get quite a bit of use out of is a reusable silicone liner. Nothing sticks- from candied nuts to cookies. Parchment paper works just as well, though cannot be reused. Cookie dough about to go into the oven. Fresh out of the oven and cooling on a wire rack. Cream the butter and sugars until smooth, about 4 minutes. Add the egg and mix well. Add the flour mixture and beat thoroughly. Stir in the vanilla, then fold in the nuts and chocolate chunks. 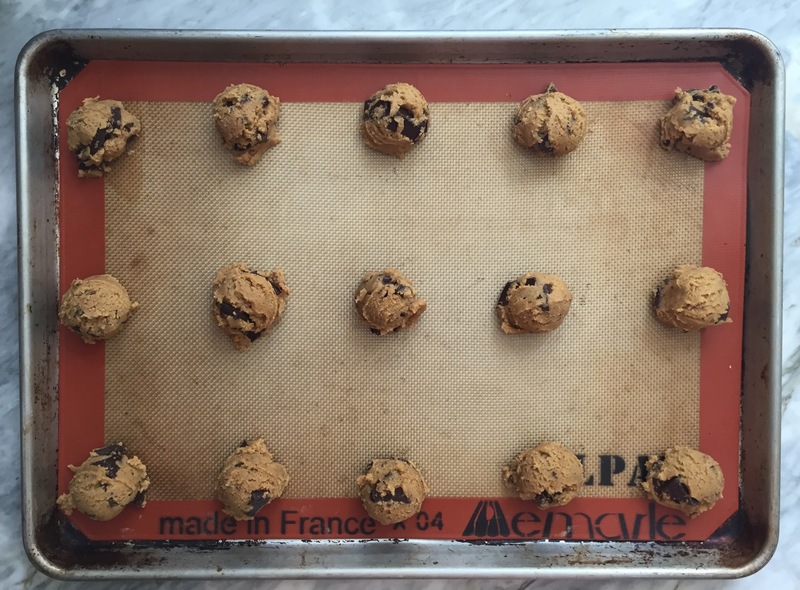 Drop in 2 Tablespoon clumps onto an ungreased cookie sheet, leaving several inches between for expansion. Bake for 10-12 minutes, or until the bottoms are lightly browned. Let cool for a minute or two on the cookie sheet, then remove to a wire rack to finish cooling. Repeat with remaining batter until used up. **The walnuts are terrific, adding even more chunks (and antioxidants) to this delicious cookie. However, because this particular batch was for a school function the cookies had to be nut free, and were just as tasty without them. Serve with milk… or red wine… or even whiskey according to the New Yorker article.